The school Labyrinth is located on Žerotínovo square in the so-called White House. You can enter the building through the common entrance with café Atlas and Sál Břetislava Bakaly. The school premises are on the 3rd, 4th and 6th floor. You can use the following services: tram no. 3, 5, 6, 11, 12 - stop Česká; tram no. 4 and trolleybus 32, 34, 36- stop Komenského náměstí. 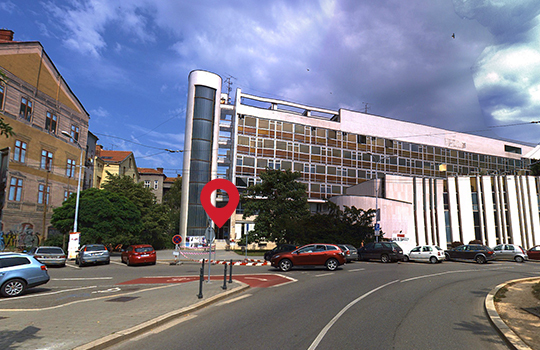 Get off at one of those stop and then walk for about 3 minutes to Žerotínovo square. You can use two parking spaces reserved for Labyrinth on Jaselská for a short-termparking. Then, you can use paid parking in front of the school on Žerotínovo square or free parking is available on the streets around the school - Jaselská, Marešova, Údolní.